Pinterest has become hard to ignore. If you need proof, take a look at this article about how Pinterest has surpassed email in social sharing. That’s a major shift. Coming up with the right Pinterest strategy--or deciding whether to use the service at all--can be a challenge. The good news is that there are a few basic rules you can use to home in on the right way to employ boards for your brand. 1. 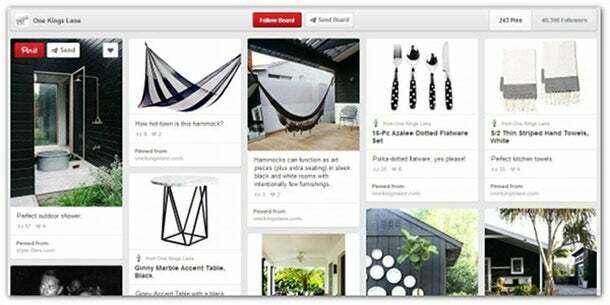 If you’re managing a lifestyle brand, Pinterest is your oyster. Pinterest is made for lifestyle brands. Your customers expect to see amazing photos of your products, from food to clothes to electronics. Don’t forget that Pinterest enables you to express the brand in many more ways than just product. For example, Sonos makes music systems, so its Pinterest board of music-related tattoos is in line with the brand, but isn’t just a bunch of photos of speakers. 2. If you’re managing a ‘boring’ brand, get creative. 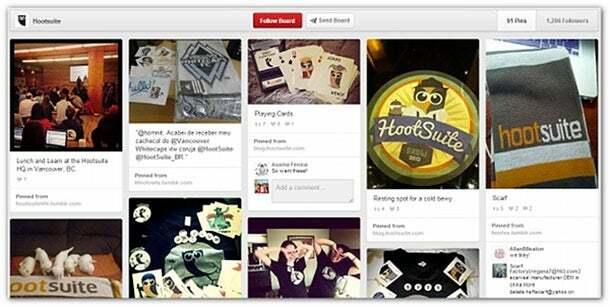 You don’t have to manage a lifestyle brand to take advantage of Pinterest to gain awareness. The trick is to get creative with what you share, and create partnerships with your customers and like-minded pinners. Don’t be afraid to offer humor, as in the example below, which stays true to the heart and soul of the General Electric brand while winking at online culture at large. 3. Got graphics? There’s a board for that. Or at the very least you can make a Board for that. 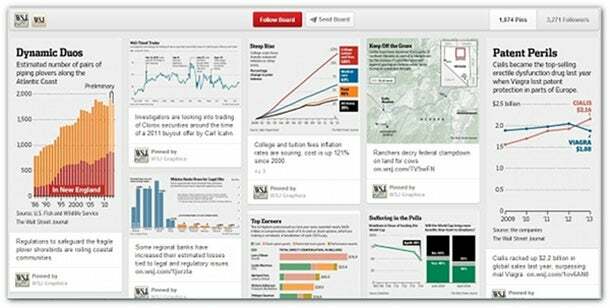 Data visualization is perfect for Pinterest, especially if the data in question is amusing, timely, or interesting. Even better: If you’re able to get across a core brand message by making it one of those three things. These can be relatively simple (but colorful) graphics as shown in the example below fromThe Wall Street Journal, or they can be more elaborate infographics. 4. Pick colors that pop--or maybe stark black and white. The most eye-catching pins tend to be those with bright colors and plenty of contrast, as on Benjamin Moore’s Doors Board. Another tactic is to create a board with bold shapes or contrasting patterns. Or try for a black and white theme, like the popular example below from One Kings Lane. 5. Get introspective with B2B. Business-to-business marketing is a difficult on Pinterest, but there’s still an opportunity to raise brand awareness, not to mention give potential customers--or job candidates--an inside look into your company culture. At the very least, the platform can be a useful HR tool, whether it’s inspiring creativity and camaraderie among employees, or providing a peek for potential hires. No surprise here that the prime example below is a social media tool itself. As for what doesn’t work, be sure to space out your pinning with reasonable timing. No one wants his or her feed overtaken by one board all at once. Also, remember that Pinterest is mostly an evening and weekend activity, so try not to pin too much early in the week. Finally, don’t leave things blank; you want to have plenty of details on your profile page and provide a description for each pin. If you follow the rules of thumb and avoid the pitfalls, you’re sure to use Pinterest fully to the advantage of your brand.